There are no easy answers to the global pollution problem, but one way we can help is by recycling damaging plastics. One of the biggest offenders, polyester, can actually be turned into recycled fabric using less energy than traditional fabric. This not only takes harmful materials out of the landfills, but also reduces the carbon footprint of your clothing. 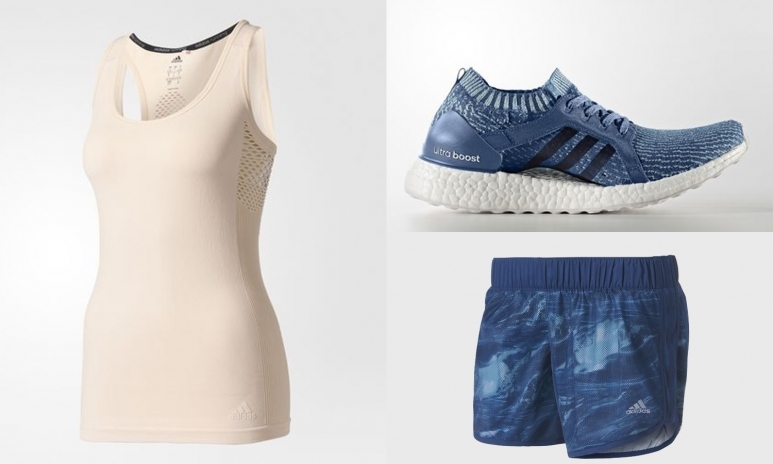 To play your part and make your workout a sustainable practice for you and the earth, check out the gorgeous eco-conscious sportswear products available from these five wellness brands—all of them are made from recycled materials. Girlfriend Collective focus on just one product—sports leggings—because they believe that's what it takes to do it right. Their meticulous attention to detail means that every aspect of the supply chain is considered, from where the bottles are recycled to their community-supportive factory in Vietnam, resulting in a high-quality and socially-conscious product. A relatively new company on the sustainable fashion front, they’ve already recycled over six million bottles for their first trial campaign, and are about to launch a full line of leggings this summer. Sports giant Adidas have partnered with Parley, an organisation solving water pollution with conversations and collaborations, to design a new sustainable product line. Using the polyester from single-use water bottles, Adidas are now turning ocean waste into the Parley Ultraboost running shoes, which will soon be joined by shorts and tops. The full range is launching this week. Rumi X’s bright and beautiful athletic and athleisure collections might just help motivate you to work out. They have a range of eye-popping prints on their tops, bottoms and sports bras, which all offer an innovative four-way stretch that creates comfort and support out of a sustainable, recycled polyester fabric. Mums-to-be will also love their line of maternity wear. This American brand is all about embracing the hippie-dippie era of Woodstock peace and love, but they’re also putting their money where their mouth is and making all of their products from sustainable materials. Teeki's gorgeous, nature-inspired yoga wear and sportswear encourage an active, socially-conscious lifestyle, and their support of ocean pollution and wildlife protection charities, as well as social issues like Standing Rock, gives their eco-efforts real meaning. RE3’s motto is to recycle, reform and revive, which is exactly what they do with polyester plastic bottles for their tops, shorts and leggings. The shapes and aesthetic of the activewear are inspired by movements in surf and yoga practice, and the local artists involved in designing each piece seek to incorporate nature, magic and mythology for beautiful and whimsical designs.